Observe which area of the pipe is leaking and then temporarily turn off the water supply to that place. The shut-off valve for a particular plumbing set up will be near the main pipe and has an external tap which simply needs to be turned in a counter-clockwise direction. Once the water supply is turned off, take a piece of cloth and wipe the pipe that you have to repair, dry. Clean the pipe so that there is no mold around that could block it later. For this, take some sandpaper that is fine, of 200 grit, and rub on the pipe surface where the leak is. This will make the pipe clean and dry making it easier for you to perform repairs. Once the surface is cleaned, take sealing plumber’s tape and put it on the place of the leak. Keep wrapping the tape till there are many layers wrapped on the pipe. Make sure that you wrap the tape around the area of the leak tightly. The wrapping must extend a few inches out on all sides of the pipe. Purchase some epoxy paste from your nearest hardware store and apply this on the place where the water seeps from. Make sure that the epoxy is applied on the pipe only after it is completely dry. This sealant is almost like putty and needs to be flattened on your palm first and then pasted on the pipe surface. Leave the epoxy to set for 20 to 25 minutes and then turn on the water supply. Your leak will have been cured. Another reason for small pipe leaks is that the threaded joints that are present between the various pieces of the pipes become loose. 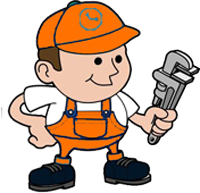 For this problem, locate the joints of the pipes and using a small wrench, tighten the bolts that attach the threaded joints. Make sure that you do not use much force as it could lead to complete cracking of the pipes. Before tightening, it is suggested that you clean the joints and dry them up with a cloth and apply some epoxy as directed in the step above. In order to fix a small pipe leak, another idea is to cover up the part where there is a slit or hole completely using a portion of your garden hose pipe. For this, cut off a section of the old hose lengthwise using a sharp knife. Wrap this part around the place on the pipe where there is a leak. Now on the underside of the pipe attach the clamp meant for the hose by inserting it on the hose part wrapped around. The clamp needs to be screwed in place where here are pre inserted screw holes. You could also wrap plumber’s tape on this part as an extra precaution.